Sahib Shihab (1925-1989) played alongside such greats as Thelonious Monk, Dizzy Gillespie, Tadd Dameron, and Art Blakey in the 1940s and 50s. But in order to escape the racial problems in the United States and take advantage of the increased appreciation and opportunities for jazz abroad, he left for Europe and settled in Copenhagen in 1962. He became one of the featured soloists in the Clarke-Boland Big Band and joined the relatively young Danish Radio Jazz Group around the same time. This group, which boasted future international jazz icons Palle Mikkelborg and Niels Henning Orsted Pedersen, gave Shihab a rare outlet to present his own compositions. This outstanding recording presents Sahib Shihab in exceptionally fine form, presiding over two sessions recorded in August 1965. Unlike most American jazz recordings of the time, there are no concessions to popular fads, rock and roll, or movie themes. All nine tracks here are Shihab originals that mix his post-bop leanings with intriguing modal experiments. Shihab sticks to baritone sax for most of the 37-minute program (except "Harvey's Tune," which prefigures the C-BBB version of Burt Bacharach's "Wives And Lovers" and the brilliantly playful "The Crosseyed Cat"), but he hardly ever dominates. He is the most democratic of leaders, letting the orchestra set the agenda and allowing ample solo space to his talented stablemates. Shihab's interesting and too-little known compositions make this disc the pleasure that it is. All start with something attention grabbing, then proceed to swing and challenge in equal measure, never moving toward a predictable destination. The opening "Di-Da," titled for the melody's staccato cadence, has a sinewy, finger-snapping crime-jazz groove. This, "Not Yet," and "The Crosseyed Cat" are the disc's best, most captivating tunes. All three deserve to be much better known. "Dance of the Fakowees," named for an Indian tribe, and "Mai Ding," named for the Japanese poet, suggest Shihab was listening closely to Sun Ra's Arkestra, but "Mai Ding" also hints that Shihab understood the R&B appeal of both Quincy Jones and Oliver Nelson's work. "Dance Of The Fakowees" and "Harvey's Tune" offer something of a tribute to the vastly underrated Francy Boland, whose musical stewardship benefited Shihab throughout much of the 1960s. Shihab himself is featured on baritone sax for the pretty "What's New"-like "No Time For Cries," and his arranging skills are prominently front-lined on the "Django"-like "Tenth Lament," which seemingly suggests Bill Holman's structures for Stan Kenton. Everything here except "Little French Girl" (which finds Shihab singing, in contrast to Jimmy Woode's vocal numbers on other Shihab records) had been formerly released on an Oktav LP of the same name and all except "Dance Of The Fakowees," "Mai Ding" and "Little French Girl" also appear on the compilation Sentiments (Storyville, 2005). 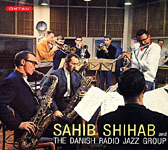 With so few examples of Shihab's magnificent artistry outside of the Clarke-Boland Big Band available, Sahib Shihab and the Danish Radio Jazz Group is a rare opportunity to hear the great baritone saxophonist and dynamic flautist doing what he does best in what is ultimately a complimentary and wondrous setting. Track Listing: Di-Da; Dance Of The Fakowees; Not Yet; Tenth Lament; Mai Ding; Harvey's Tune; No Time For Cries; The Crosseyed Cat; Little French Girl. Personnel: Sahib Shihab: baritone sax, flute, cowbell, vocal (9); Palle Bolvig, Palle Mikkelborg, Allan Botschinsky: trumpet and flugelhorn; Torolf Molgard: tuba, eufonium; Svend Age Nielsen: trombone, bass trombone; Poul Kjaeldgard: tuba, trombone, bass trombone; Poul Hindberg: alto sax, clarinet; Bent Jaedig: tenor sax, flute, clarinet; Niels Husum: tenor sax, soprano sax, bass clarinet; Bent Nielsen: baritone sax, flute, clarinet; Ib Renard: baritone sax; Louis Hjulmand: vibes; Fritz Von Bulow: guitar; Bent Axen: piano; Niels Henning Orsted Pedersen: bass; Alex Riel: drums.